Derry's Rory Patterson celebrates scoring (file pic). 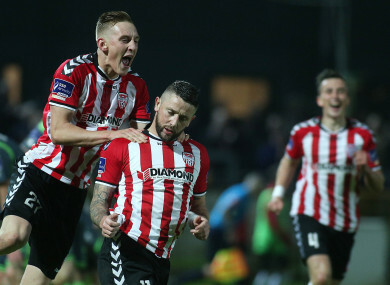 DERRY CITY CONTINUED their winning run of form with a 2-0 victory over Sligo Rovers at The Showgrounds — their fourth consecutive league victory. A goal from Rory Patterson and Ronan Hale’s sixth of the season saw the visitors win at The Showgrounds for the first time since 2009. The Bit o’Red’s recent form has been nothing short of dreadful, picking up just two wins all season and losing their last two. Derry, on the other hand, came into this game having won their previous three league games. The Candystripes were well on top from the off, with the Bit o’Red unable to leave their own half for most of the opening 20 minutes. Aaron McEneff was causing Rovers a host of problems early on. The influential playmaker’s fourth minute free-kick was well saved by Micheál Schlingermann, before his cross was nodded just wide by Ronan Curtis. Derry should have taken the lead when Curtis was gifted an opportunity thanks to a Rhys McCabe error. One-on-one with Schlingermann, he blasted it straight at the Mayo man, before the Foylesiders deservedly went ahead on 16 minutes when Patterson’s free went through the Sligo wall, taking a massive deflection on the way, with Schlingermann wrong-footed. An excellent interception from the impressive Conor McDermott prevented Ally Roy from getting through on goal when he got on the end of David Cawley’s through ball. The Candystripes were by far the better team once again after the re-start, with Ger Lyttle required to use all three substitutions on the hour mark during an uneventful period of play. Schlingermann was forced into a great save when Curtis unleashed a powerful left-footed drive at goal, before the former Drogheda man was beaten once again. Hale’s low drive into the box went under Schlingermann to double Derry’s advantage on 75 minutes. Derry appear to have got over their early season blip, but the misery continues for Ger Lyttle’s side, who remain second bottom in the table. Sligo Rovers: Micheál Schlingermann; Gary Boylan, Kyle Callan-McFadden (Seamus Sharkey, 59), Patrick McClean, Calum Waters; Caolan McAleer, David Cawley, Rhys McCabe, Ally Roy (Eduardo Pinceli, 59); Greg Moorhouse, Adam Morgan (Raff Cretaro, 59). Derry City: Ger Doherty; Conor McDermott, Gavin Peers, Eoin Toal, Jack Doyle; Ronan Hale, Nicky Low, Rory Hale, Aaron McEneff, Ronan Curtis (David Hopkirk, 82); Rory Patterson (John Cofie, 88). Email “Derry City pick up fourth consecutive league win at Sligo's expense”. Feedback on “Derry City pick up fourth consecutive league win at Sligo's expense”.